Spiral Wishing Wells have raised over $1 billion for churches, charities and non-profit organizations around the world since 1985. Much of this has been in museums, zoos, and retail stores that raise money for their preferred corporate charities. All non-profits are becoming more creative in their fund raising efforts. Specifically, more and more churches are getting Wells to help raise money for missions, building campaigns, and youth programs. 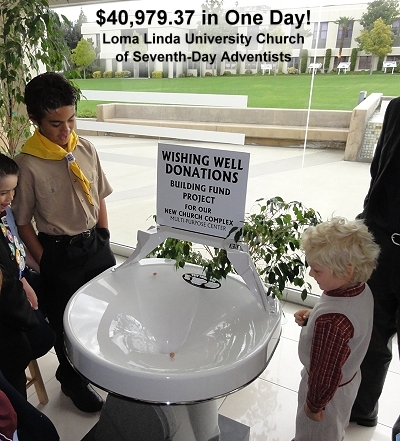 The Loma Linda University Church of Seventh-day Adventists in Loma Linda California, about 70 miles east of Los Angeles, recently added a Wishing Well to their building campaign. Doug Welebir, Chairman of the Building Campaign found the Well while searching the web for fund raising ideas. Welebir explains, "We liked the idea of trying to set the one day record . We set a goal of $25,000 and my wife Constance arranged a $12,500 matching fund gift from Fund Raising Committee members and other friends if the congregation would raise another $12,500. We decided to incorporate the 'kick-off promotional strategies' posted on the Wishing Well website that encourage churches to use the Well as a focal point for their fundraising. Beginning two weeks in advance of the big day, from the platform, with power points, and in the bulletin, we challenged the congregation to break the record. We encouraged the kids to hunt for coins in seat cushions and laundry rooms, for Dad's to bring the jars of coins that have been accumulating on their dressers, and others to write checks and donate bills that would be applied to the record attempt. The $25,000 goal seemed ambitious, and some on the committee expressed doubts. But sometimes, you just have to try, and watch how the Lord will bless your efforts! "The week before the event, I held up a $50 gold coin that someone had donated, and suggested that others might have valuable coins they would want to watch spin around the funnel. During that week, two coin collections were brought to the church. One collection was 6,903 old silver dimes donated by an elderly couple. After a quick evaluation, the church was offered over $15,000, but we will take the time to have the coins evaluated for their individual collector value. It took us a while to count everything, but so far, the total is $40,979.37, with additional value still being determined!" Gary Wernick, another member of the fund raising committee reports, "The Well is still bringing in several hundred dollars each Sabbath. Parents are delighted with their children's active giving to the Building Fund. The Well has given us a way to keep the Building Fund Project foremost in people's minds." Obviously, Wishing Well records are not set merely by coins being dropped into the funnel. Record attempts use the Well as a focal-point to attract pledges, matching grants, coin collections, checks, bills, "Free Vortx Toys for $25 to $50 donations," along with coins dropped into the Well. So the majority of the money at promoted events is raised from those other sources...not necessarily coins dropped into the Well. The Well is used to motivate donations. Even if you are a small church, school, or organization, you can still maximize your income with a focus on the same things this church did. We receive many reports of over $1,000 in a single "kick-off" day. A small school raised $7,352 for a grand piano using a Wishing Well as their focus. So even if you don't break the record, you will love the results from using the same suggestions and strategies. To read more about how you can take advantage of a "kick-off" event, click here. Of course, the money raised at an event is only the beginning of what a Spiral Wishing Well can do for you. It will continue to raise revenue, and if you use our "Church Program" it will be a great outreach device that will let your community know who you are.